Prehistoric labyrinths are believed to have served as traps for malevolent spirits or as defined paths for ritual dances. 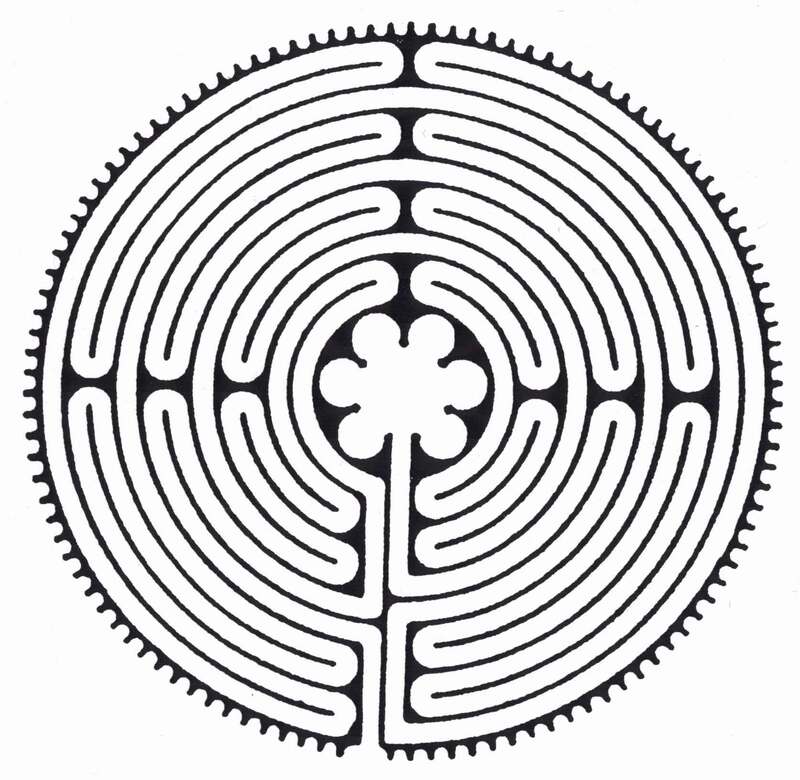 In medieval times, the labyrinth symbolized a hard path to God with a clearly defined center (God) and one entrance (birth). In their cross-cultural study of signs and symbols, Patterns that Connect, Carl Schuster and Edmund Carpenter present various forms of the labyrinth and suggest various possible meanings, including not only a sacred path to the home of a sacred ancestor, but also, perhaps, a representation of the ancestor him/herself: "...many [New World] Indians who make the labyrinth regard it as a sacred symbol, a beneficial ancestor, a deity. 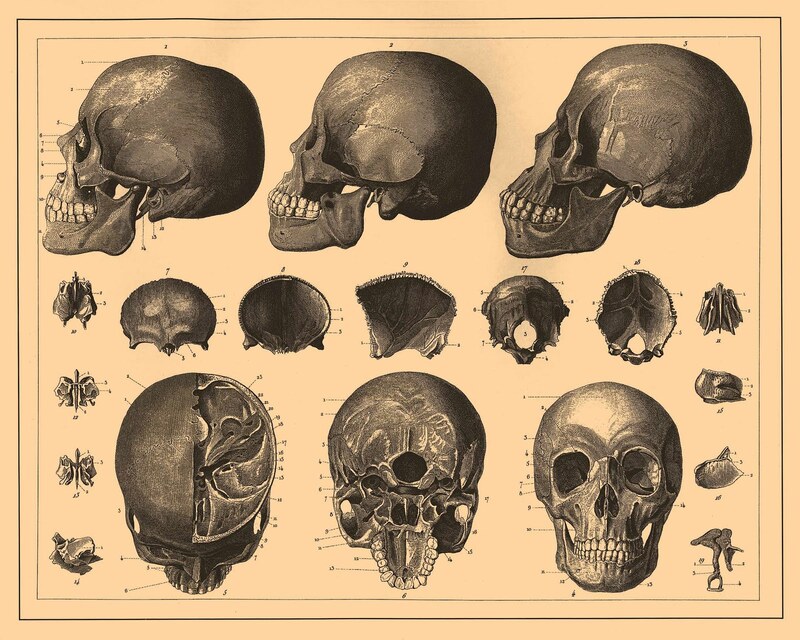 In this they may be preserving its original meaning: the ultimate ancestor, here evoked by two continuous lines joining its twelve primary joints." One can think of labyrinths as symbolic of pilgrimage; people can walk the path, ascending toward salvation or enlightenment. Many people could not afford to travel to holy sites and lands, so labyrinths and prayer substituted for such travel. Later, the religious significance of labyrinths faded, and they served primarily for entertainment, though recently their spiritual aspect has seen a resurgence. Walking among the turnings, one loses track of direction and of the outside world, and thus quiets the mind. They are energy grids that have been around over the centuries, paths for personal, psychological and spiritual transformation. To traverse the labyrinth is a journey into the center of our own being and the return to our divine source. Each single round of a labyrinth is called a circuit. The labyrinth embodies a “unicursal” design: It has one continuous path. The path in is the path out. There is no wrong way to walk it. There are no dead ends. You can’t get lost. Before you enter, allow each part of your body to relax. Breathe slowly and deeply. As you approach your walk, release your concerns, and be open to receiving. Consider bringing an issue or a question to your walk. This allows you to focus the intention of your walk and receive guidance. To walk the path is to know and trust that guidance is available to you. Allow yourself to be who you are and to walk in whatever way is best for you. Your experience will be yours, and whatever you experience, know that it is right for you. Among the meander labyrinths, there are 2 main designs, the seven-circuit type and the medieval design. 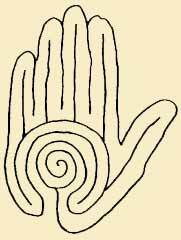 The seven-circuit ones are also known as Cretan Labyrinths. 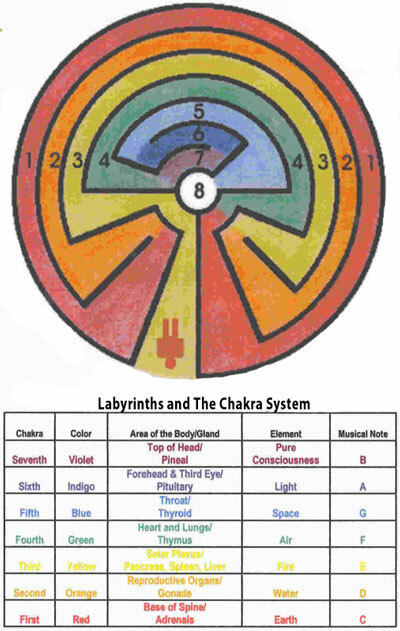 If you work with the chakras, it indicates that you go through the heart (4) from the material world (1, 2, 3) to the spiritual world (5, 6, 7). The heart is in the centre. This strengthens the knowing that love is all there is. Love is the only truth, the only reality, the only power. Love is eternal. If you draw lines in the sequence that you walk the labyrinth; that is 3-2-1-4-7-6-5, it forms what looks like a cup. This cup, some say, relates to the Holy Grail and its secret knowledge. The wisdom lies within. Your heart is known by the path you walk. Labyrinth is indeed a complex and confusing structure, but it is not a maze! Unfortunately, only a few people know about this difference. 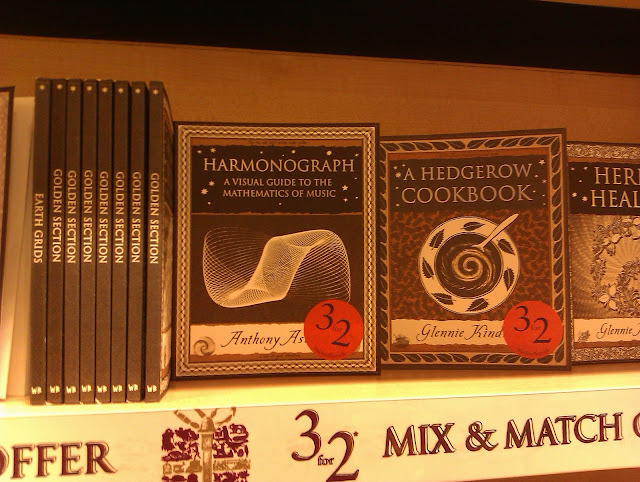 Therefore, in general use, we have the Platonic function of the labyrinths as a synonym for confusion and disorientation. Look at the picture of a simple maze. As you can see, it has an entrance and an exit on two opposite sides. As soon as you enter, you face a dilemma: to head on straight or turn left. If you turn left you will find yourself in a dead end street and you will have to go back. In some places there are crossroads where you can choose whether to go one way or the other. In this maze there is only one correct path that leads to the exit. However, it is possible to construct a maze whose paths connect, meaning there can be alternative paths that lead to the exit. If this maze was more complex, one could spend hours in it before finding a way out. The popular term ‘labyrinth’ is often wrongly used to describe these kinds of structures (in parks and similar). As I have pointed out, a maze significantly differs from the definition of a real labyrinth. Here is how a labyrinth looks like. This is also a complex and a confusing structure, at least when you first look at it. Still, if you examine it more closely you will discover it only has one entrance (which is also an exit), so there are no crossroads or dead end paths. This means that after you reach the centre you go back the same way to reach the exit. As much fun and likable mazes can be, they are not labyrinths. While mazes symbolize the process of deciding and reaching decisions, stimulating the mind to get around (the body, also if they are the right size), labyrinths are true patterns of power that work on a much deeper level than pure logic and getting around. 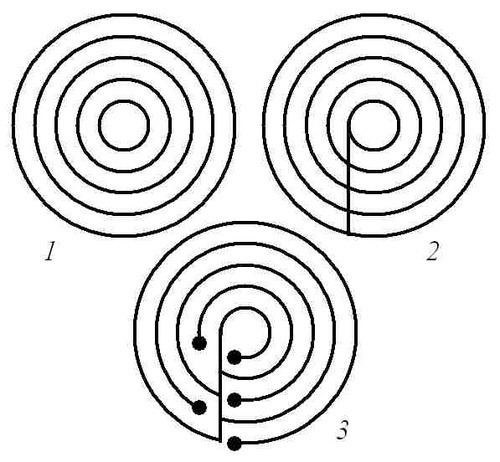 The 7-circuit labyrinth is drawn as shown. To draw an 11-circuit labyrinth, add an "L" in each corner and follow the same plan as for 7-circuit -- see diagram, lower right.